Bayern Munich travelled to the Estadio da Luz last night looking to advance to their fifth consecutive Champions League semi-final. Carrying a 1-0 victory from the first leg in Munich, the table-topping Germans took on a Benfica team also leading their domestic league, hoping to avoid a repeat of their last trip to Portugal, which ended in a 3-1 hammering at the hands of Porto. Benfica have gained many plaudits for their defensive system. Defending in a compact 4-4-2-0 block, they were content, for most of the game, to let Bayern have the ball in their first line, focusing instead on preventing the Germans from progressing up the pitch. With Pizzi moving up beside Raul Jimenez, the two forwards stayed compact, ball-oriented and pendulating as to restrict passes through the space between them. The role of the forwards in Benfica’s defensive system cannot be overstated. Given that the Lisbon side play with only two central midfielders, it is of great importance that they do not allow themselves to be overloaded in that area. Therefore, by deflecting Bayern to the flanks early in the build-up, they essentially took away this option for the Bavarians. It was when the ball was away from the central channel of the pitch that Benfica displayed one of the interesting aspects of their play against the ball. Whilst the midfield partnership of Ljubomir Fejsa and Renato Sanches would stay positionally compact when Bayern had central possession, once that had been deflected, their positional references changed. The ball-near central midfielder would man-orient himself against the Bayern midfielder in his zone, whilst the ball-far one would look instead to position himself at the head of a triangle with the two central defenders. In doing so, he would neglect to acknowledge the positioning of any Bayern player in the weak-side halfspace. 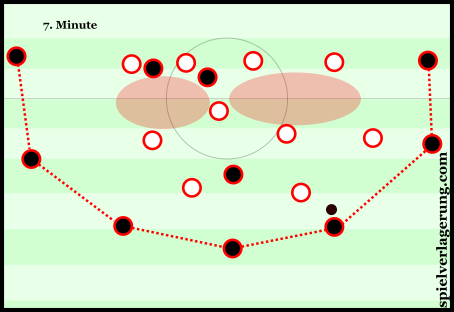 The man-orientation on the ball-near side made it difficult for Bayern to play back inside from a wide position, while the position-oriented nature of the far midfielder gave balance, allowing him to maintain access to relevant players even in the event of a switch of play, without the risk of being pulled out of position. Benfica’s midfield orientations: man oriented on the ball-near side, position-oriented on the other. The fullback here also has direct access to Bayern’s winger. There were, however, some problems. 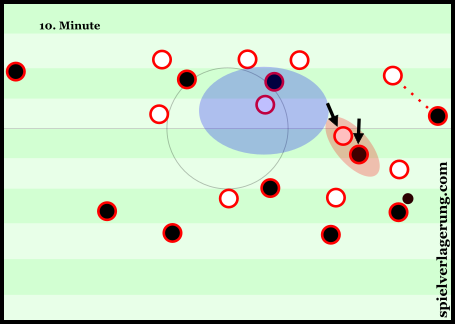 On the occasions in which Bayern were able to overcome the man-orientation on the near side – whether that be through individual or collective press resistance – the covering midfielder was often left exposed. It was in these moments that the Germans enjoyed their best spells. Additionally, since the covering midfielder would not track the runs of Munich’s far side midfielder, the Portuguese back line had to deal a couple of times with vertical runs from deep – especially from Arturo Vidal. Benfica’s fullbacks also contributed greatly to the defensive scheme. When Bayern played passes up the line to their wingers, they were pressed aggressively by their opposing fullback. 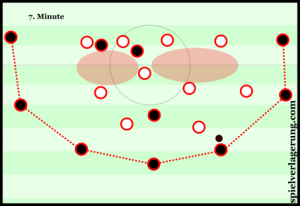 Preventing them from turning, the fullback would harass the winger – sometimes even back into the away side’s half – with either the Benfica wide or covering midfielder filling in the space left behind. Overlapping runs made by David Alaba or Phillip Lahm would be tracked all the way to the offside line by Eduardo Salvio or Mehdi Carcela respectively. Bayern employed an interesting tactic in order attempt to smooth their first progression against the Benfica forward line. In phases of sustained possession, the two central defenders – Joshua Kimmich and Javi Martinez – would swap sides, with Kimmich moving to operate on the right of the two. Pep Guardiola isn’t shy of asking his central defenders to swap sides, although these changes are rarely as fluid as what was displayed in Lisbon on Wednesday night. Moving Kimmich to the right hand side helped the Bavarians utilise their full array of strengths. With Xabi Alonso naturally dropping into the left hand side, the converted central defender struggled to use his full range of passing. Despite his unrivalled penchant for pinging raking passes across the pitch, over defensive blocks to free wingers, Xabi Alonso is notably poor in his positional play. In the early moments of the game, he would block Kimmich’s passing lanes, and position himself too close to the youngster. What Xabi Alonso needs to function best in that position in the left halfspace is a player who will just feed him simple passes in front of the opposition’s defensive block. Given Kimmich’s ability to play incisive passes, having him as Alonso’s supplier is a wholly inefficient use of the team’s talents. Furthermore, Javi Martinez’s struggles to play risky passes to players with a lot of opposition attention were strikingly evident. He turned away from a couple of opportunities to pass wide to Lahm or Douglas Costa in the opening exchanges. In swapping his two central defenders over when Bayern had stable possession, Guardiola ensured that his team could establish better connections on the right hand side, without affecting Xabi Alonso’s ability to dictate play. Guardiola’s focus on the flanks has been a feature of his time in Munich, but was especially noticeable in this match. As mentioned before, the customary booming diagonals from Xabi Alonso put Douglas Costa in favourable 1v1 situations – as has been the case all season. However, since Franck Ribery has exploded back onto the scene after a long spell out injured, Costa has been shifted to what was, before this season, his natural position on the right hand side in order to accommodate the in-form Frenchman. Having made his name with Shakhtar Donetsk cutting in from the right hand side onto his left foot, it was ironic that the Brazilian caused his own team more problems with his trademark move. With Benfica both capable and comfortable defending the centre of the pitch, Costa’s incursions off his right flank were often straight into a stable Benfica block. The setup of Benfica’s midfield only compounded this issue. Since the ball-far midfielder was position-oriented, he could not be dragged away from that area in front of the defence by Thomas Muller’s, Thiago’s or Vidal’s vertical movement, thus meaning that there was no possibility for diagonal dribbling across the top of the Benfica penalty area. More disappointing, perhaps, was Costa’s lack of variance in a clearly flawed approach. Despite being handed isolated 1v1s on a plate throughout the game by Alonso and Kimmich, the winger would invariably choose to cut inside, rather than blaze past the fullback on the outside as he does on the left flank. With infrequent overlaps from Lahm, Bayern struggled to create chances from the wing. However, the Bavarians managed to create a couple of chances through Costa and Lahm’s work. On a couple of occasions in the first half, Lahm made a penetrating underlapping run behind the fullback where Costa found him with delicate reverse passes. The first of these ended up in a dangerous, yet intercepted cut back, while the second resulted in what turned out to be the key goal in the tie, as Lahm’s cross was punched out to an awaiting Vidal to smash home. Douglas Costa’s propensity to cut inside with the ball led to other Bayern problems. With poor central occupation, the visitors struggled to find a way back into the pitch once they had played wide. This, therefore, made it difficult for them to satisfy the need to break down Benfica by starting their attacks on one side to finish on the other. In particular, there were many occasions where the wingers would be on the same vertical line as their fullback on the touchline, resulting in straight passes which were straightforward for Benfica to press, preventing the wide player from turning. Without a central option to lay the ball off to – or to play to in the first instance – Munich struggled in these areas. Bayern struggled to occupy key areas of Benfica’s defensive block, and at times fell into the dreaded horseshoe-shaped pattern. These problems stemmed from the Germans’ first progression. Alaba and Lahm were unadventurous in their positioning for much of the first half. 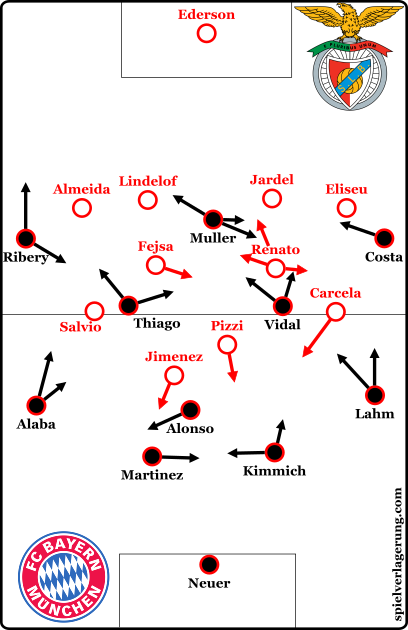 Though this may have been a conscious effort to manage any turnover in possession, to make sure they were not caught out on the counter attack, combined with Alonso’s movement to the left of the central defenders, this ultimately resulted in Bayern approaching the first progression with a 5v2. While this may sound appealing, the reality was that this numerical superiority was rarely carried into consequent progressions, essentially leaving the away side with a huge underload in central areas higher up the pitch, leading to the aforementioned problems with connectivity. It took Bayern Munich until just before half time to begin to really solve these problems. Throughout the match, Thiago would often make positional switches with Ribery, which were of great benefit when the Spaniard was man-oriented against by Fejsa. In moving central, Ribery was able to gain possession freely in a dangerous area. However, these moments were far and few between. Bayern finally started making inroads into finding a more consistent method of overcoming the Benfica midfield when they started to develop central overloads. Ribery could often be found in the left halfspace, allowing Thiago to drop deeper. This, combined with Vidal’s natural tendency to make forward runs, gave Munich a depth to their midfield which they had not had previously. Drawing the Benfica midfield out, Bayern were able to comfortably progress the ball between the lines and directly attack the Portuguese defensive line. In the second half, the problems which Guardiola’s men had had earlier had all but vanished. Lahm took a much more proactive role in the first progression, looking to affect Carcela much more with his positioning. In addition, he played much more in the halfspace, in the inverted role we have become accustomed to seeing him in. This further enhanced Munich’s presence in the centre, and went a long way to helping them overrun what had been a very resolute defensive unit. As the game went on, and Benfica had to push more for another couple of goals, it became much easier for Bayern, as there was much more space to both build behind, as the home side pressed more aggressively, and to counter in, as they threw bodies forward. By the time Munich got their second goal from a well-worked corner, the result of the tie was a formality. Bayern were far from their best in Lisbon, but can take some encouragement back home with them. The performance of Franck Ribery was yet another notable one, whilst Joshua Kimmich gave them a solid platform from which to attack from. Whilst this performance was good enough to get them into the semi-final, they’ll need to show much improvement should they draw Simeone’s Atletico Madrid. how do you rate rui vitoria as a manager? André Almeida is the right back and Eliseu is the left back of the Benfica team. Not the other way around. By the way, it is not Fesja but Feysa. This article was more about of what Bayern did and could have done more. Any comments on the Renato Sanches performance? Renato Sanches impressed me a lot – again. He sometimes lacked intensity in his defensive covering movements, which left Fejsa(!) isolated at times, but his positioning was mostly very good. On the ball he was very useful – his composure and pass selection were particular highlights. Bayern’s strong horizontal compactness in pressing required them to have constant access to the Benfica players around the ball in order to prevent them from exploiting their overloads on the weak side. Renato Sanches was able on a couple of occasions to bypass the pressure and find a free player, who would in turn switch to the opposite flank. He’s clearly a fantastic talent, playing at a level far beyond his years, and I’m very excited to see how he’ll develop.